It seems like almost everything is getting smarter these days—the garage included. Companies like LiftMaster are releasing new technology and improving their products every year. For many of us, the garage is the main entry point to our homes that we use multiple times daily, so making the process of entering and exiting easier for us and more difficult for strangers (to prevent break-ins) makes perfect sense. Here are a few smart options you have for your garage to make it safer, easier to monitor and control, and more secure. 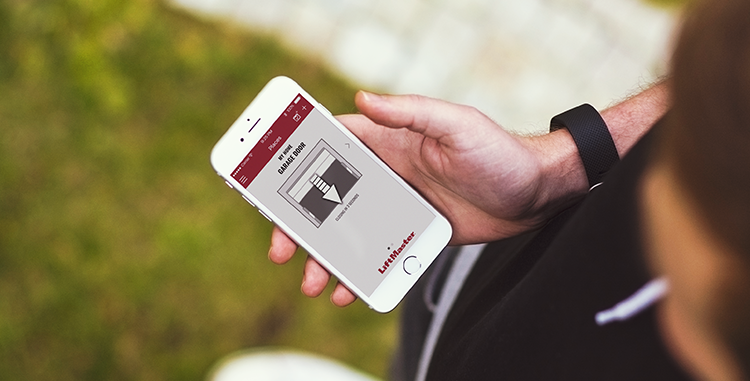 LiftMaster’s latest Wi-Fi garage door opener is the Elite Series 8550W. This DC motor belt opener is quiet, powerful, and holds the highest rating in LiftMaster’s opener lineup. It’s fully equipped with MyQ Technology, a battery backup system (to ensure you still have access to your garage in the event of a power outage), and Security+ 2.0 (which sends a new code to the opener every time it’s used so the door doesn’t open when it’s not supposed to). The PosiLock electronically monitors the door; if someone tries to use force to open the garage door, it will lock before they can. You can preprogram your door to close after a set number of minutes with the Timer-to-Close feature. A motion detector is also integrated into the garage door opener's control panel to detect movement and illuminate the garage when it senses motion. If you have a Wi-Fi garage door opener that connects to the internet and is equipped with MyQ Technology, simply install an app on your cell phone, computer, or tablet, and you can monitor and control your garage door from any location. You’ll never have to worry about leaving your garage door open again or risk someone opening your door and breaking in without your knowledge. You’ll receive alerts via app notifications or email notifying you of your door's status. Are you an Apple product user? The MyQ Home Bridge will add HomeKit compatibility to your Wi-Fi or MyQ-enabled garage door opener. With it, you can "tell" your garage door to open or close with Siri! You'll also be able to control all of your other HomeKit-enabled accessories using the app. LiftMaster's automatic lock is sold separately from the garage door opener. Install the deadbolt to work in tandem with your opener to make your garage “virtually impenetrable.” It will automatically lock and unlock as you open or close your door. After the door shuts, you’ll hear the lock engage so you know your garage is secure. If you’re interested in installing any of these products to modernize your garage, contact WD Door! We repair and install garage doors and openers in and around Des Moines, IA. Ask us for a quote or browse our blog or website for more information. WD Door is a privately owned overhead door and operator company with over 25 years experience in both residential and commercial fields. We work closely with both our customers and manufacturers to ensure high quality overhead door products and customer service.